Bloodhound Dogs - A Bloodhound, also known as the St. Hubert Hound, is a large breed of dog in the scenthound and hound class. 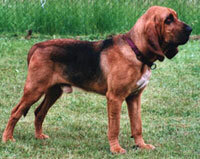 The Bloodhound is a hunting dog and is famed for its keen sense of smell and its ability to follow a scent many days old, over vast distances. The Bloodhound is used in hunting to track wounded animals, and by public authorities to track and locate human beings, as in the case of border patrol, escaped prisoners, missing children and earthquake victims. The Bloodhound is extemely affectionate, and gets along well with its human companions and other dogs. This information is licensed under the GNU Free Documentation License. It uses some material from the Bloodhound article on Wikipedia.org. Bloodhound Breeders - Advertise your kennel puppies and dogs here. Southern Winds Bloodhounds - Alabama - Breeding top quality CKC registered Bloodhounds for show, working and companion homes.